The impact of climate change on the Antarctic Peninsula is evident in new satellite data, US researchers say. 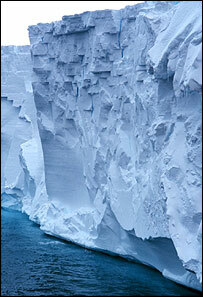 The collapse of the Larsen B ice shelf two years ago has accelerated the flow of glaciers into the nearby Weddell Sea. It is probable the disintegration in 2002 has now allowed the glaciers to deposit their loads more freely, the team tells Geophysical Research Letters. The Antarctic Peninsula has seen some of the fastest temperature rises on Earth in the last five decades. The scientists used a variety of data from satellites to track the speed of the glaciers before and after the collapse of Larsen B. 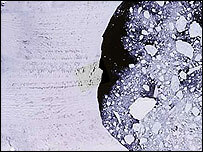 In one study, Ted Scambos of the National Snow and Ice Data Center in Boulder, US, analysed five images taken by the Landsat 7 satellite between January 2000 and February 2003. The analysis reveals that four glaciers flowing into the now collapsed section of Larsen B increased in speed by between two and six times over the study period. "If anyone was waiting to find out whether Antarctica would respond quickly to climate warming, I think the answer is yes," said Dr Scambos. The second report, by Eric Rignot of the US space agency's Jet Propulsion Laboratory in Pasadena, US, showed an eightfold increase in the speed of three glaciers, called Hektoria, Green and Evans, between 2000 and 2003. Two others, Jorum and Crane, moved twice as quickly at the beginning of 2003 than they did in 2000 and nearly three times as fast by the end of the year. "These two papers clearly illustrate, for the first time, the relationship between ice shelf collapses caused by climate warming, and accelerated glacier flow," said Dr Rignot. The extra ice presumably translates into higher sea level. But how much this is raising the level of the oceans isn't known. So further warming could lead to much larger quantities of ice falling into the sea. The Antarctic Peninsula is one of the three fastest-warming regions on Earth - temperatures have risen 2.5 degrees in 50 years. But the picture generally in Antarctica is complicated, with temperatures in the interior actually falling over the same period. There is also some evidence that the retreat of the West Antarctic ice sheet, on the other side of the peninsula to the Larsen B shelf, has halted.